Born into a militant aristocratic family near Bergamo, began his career as a condottiere in 1419 in southern Italy, first under Braccio da Montone and then under Muzio Attendolo Sforza. His first major engagement was the battle of Aquila in 1424. His first Venetian contract came in 1431 and he took part, under the command of Gattamelata, in the anti-Visconti campaign around Cremona. After returning to the south once more he followed Gattamelata back into Venetian service in 1438-41 for the fourth phase of the Republic's war against Milan. Such success as came to Venice was acknowledged as in no small measure to his courage and shrewdness, and when Gattamelata died in 1443, and Piccinino in 1444, only Francesco Sforza stood in such high esteem among Italian condottieri. Colleoni fought under Sforza for Venice in 1448, but it was not until the Peace of Lodi in 1454 settled the interminable wars between the Republic and Milan that he was offered the command-in-chief; it was thereafter Venice's chief concern to prevent his going off in search of wars elsewhere. From contracts, booty and the gifts Venice made to keep him faithful he became rich in money and properties. During the last years of enforced idleness his favourite residence, the castle of Malpaga, became the centre of a lavish court where painters and men of letters were welcomed among Colleoni's comrades-in-arms; in scale and fame Malpaga was a less refined anticipation of Caterina Cornaro's Asolo. It was after his death that Colleoni came to be most closely associated with the arts. In part this was through the completion of the superb Cappella Colleoni (Bergamo), designed by Giovanni Antonio Amadeo (it had been begun in 1472), and the erection in it of his elaborate tomb, topped in 1500 by his life-size effigy on horseback in gilded wood. 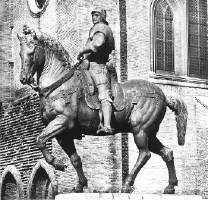 But chiefly he is remembered for Verrocchio's bronze equestrian statue alongside the church of SS. Giovanni e Paolo in Venice. Colleoni, in his will, had left 100,000 ducats to the Republic to spend on war against the Turk. He did this, he said, as a sign of his gratitude for the favours he had received, and he coupled with the gift a request that to keep his name alive a statue of him on horseback might be erected in Piazza S. Marco. There is no doubt that Colleoni wished to be viewed by posterity with no less respect than was accorded other condottieri who had been remembered in this way, such as Hawkwood or, most notably, Gattamelata. Whether or not the words 'super platea S. Marco' were deliberately read as meaning . 'on the piazza of the scuola of S. Marco', it is inconceivable that Venice, habitually suspicious of its military commanders, would have allowed a monument to one so near to the Doge's Palace and his church, S. Marco. Colleoni had fought and lived on a grand scale (and had enjoyed the display of his emblem: a set of coglioni - testicles), but if he was the state's benefactor, he was also its servant.